Car floor mats are a great way to keep the interior of your car clean and away from damage. WeatherTech mats are durable for any temperature. Car floor mats are used to protect your valuable investment by reducing the possibility of liquid, dirt, mud, and debris from damaging or staining your vehicle’s interior. They can be carpet, rubber, or a mix of the two and can enhance the look of your interior as well as protect your valuable investment. YourMechanic has several recommendations on how to purchase a quality floor mat. Once you know what you need, there are several floor mat options to choose from. Custom mats are a great option, but can be expensive as they need to be custom-fitted to your vehicle. An alternative to a custom-fitted mat is a universal car floor mat. Often, these mats are less expensive than custom-fit options and can be trimmed to fit better in your vehicle. Check out the following 10 best universal car floor mats. Featuring non-slip backing, the all-season four-piece vinyl floor mat set features raised borders to help trap debris and liquid from damaging your vehicle’s interior. With a universal fit that works with most makes and models, the mats are made from clear vinyl to help match any vehicle interior color. 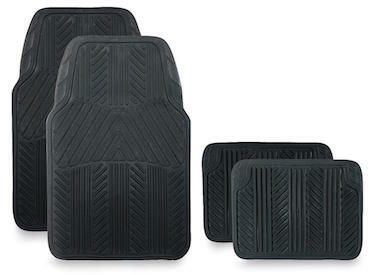 The four-piece carpeted floor mat set from Kraco is an eco-friendly car mat made from recycled all-weather durable carpet with an embossed protective carpet heel pad for comfort and interior protection. The universal car floor mats also feature an anti-skid nib backing. 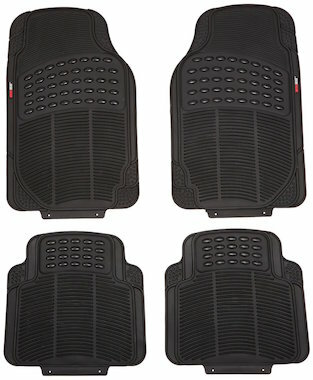 Buy the Carpeted Floor Mat Set from OReillyAuto.com. The ProElite universal fit car floor mat features anti-skid backing, and the heavy weight of the mat is enough to stay steady on the floor of your car. The mats can be trimmed for a more custom fit to your vehicle, and feature a rib design and raised border to keep liquids and debris from damaging your vehicle’s interior. The mats are also available in tan. Buy the ProElite Floor Mat from AutoZone.com. The OxGord four piece universal fit floor mats are made from rubber to protect a vehicle’s interior from the elements, and act as a shield while channeling mud and water into easy-to-clean pockets and ridges. The mats can also be trimmed to custom-fit your car. The BDK Rubber Series Universal Fit floor mats are a three-piece set made of all-rubber, which is vulcanized for further strength and durability. The mats feature diamond ridges and outer textures to trap dirt and debris for interior protection. Buy the BDK Rubber Series Floor Mats from CustomAutoCrews.com. 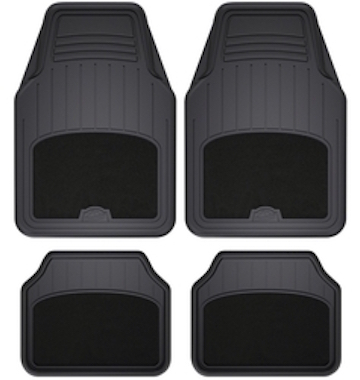 The heavy-duty, four-piece universal rubber floor mat set from ARMOR ALL provides front and rear floor coverage for most car makes and models. A carpeted section provides comfortable foot space, while keeping the vehicle’s interior clean from mud and debris. The carpet insert is stain resistant, and the Carpet Claw patent-pending technology keeps front mats from moving around. Buy the Rubber Floor Mats from OReillyAuto.com. The thick, heavy-duty arrow floor mats from MotorTrend remain flexible for floor contours, yet are built tough for all-weather use. The BPA-free, odorless rubber features an arrow design, as well as linear and diagonal ridges to trap dirt and debris. The trimmable mats can be custom-fitted to almost any make or model of car. The mats are available in black or gray. 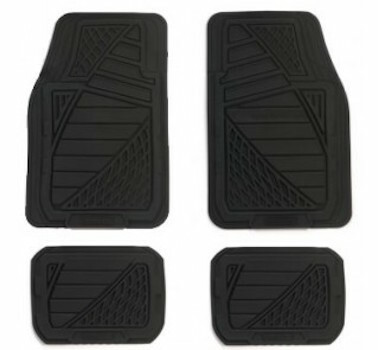 Buy the MotorTrend Heavy-Duty Car Floor Mats from Amazon.com. 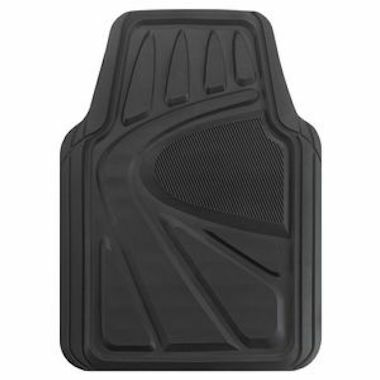 The Firestone All-Weather Heavy Duty Rubber Floor Mats feature a tread design pattern inspired by Firestone tires. The odorless, soft rubber will mold to your vehicle’s floor, without curling or cracking in extreme temperatures. The universal design can be trimmed to custom-fit most car makes and models, and the deep channels can keep snow, mud, water, and dirt from damaging the interior. In addition, the four-piece set of mats feature an anti-skid backing to help keep them securely in place. Buy the Heavy-Duty Rubber Floor Mats from Amazon.com. 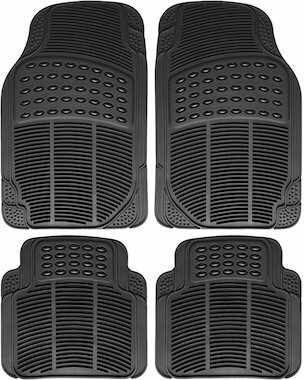 The heavy-duty floor mats from Goodyear are a four-piece set constructed with deep pockets. The mats feature three “zones” for dry, snow, and water weather protection and are held in place by anti-skid nib backing to help ensure the mats stay in place, yet are easy to remove for cleaning. In addition, the mats can be trimmed to custom-fit most makes and models and are available in black, grey, and tan. Buy the Heavy Duty Rubber Floor Mat from KracoEnterprises.com. WeatherTech universal all-vehicle mats (AVM) are trim-to-fit vehicle floors to help protect your car’s interior from fluid, grime, and moisture. 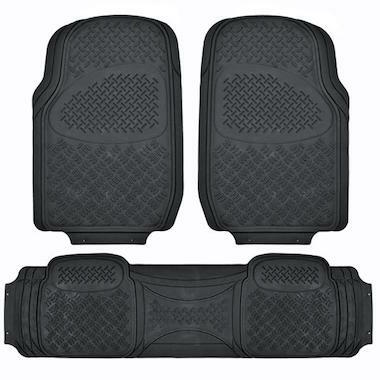 Available in both a first- and second-row four-piece set, or a three-piece set for $54.95, the floor mats feature a tall outer ridge and reservoir to trap fluids and debris. The mats are made from an advanced thermoplastic elastomer, which is non-toxic and stays flexible even in cold temperatures. The mats are available in black, tan, or gray. 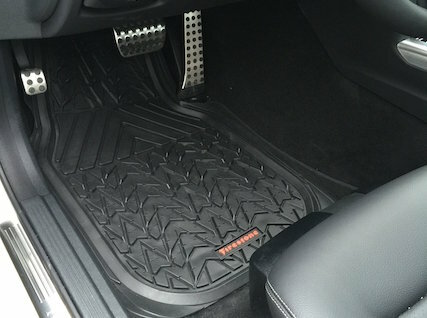 Buy the AVM All-Vehicle Floor mats from weathertech.com. 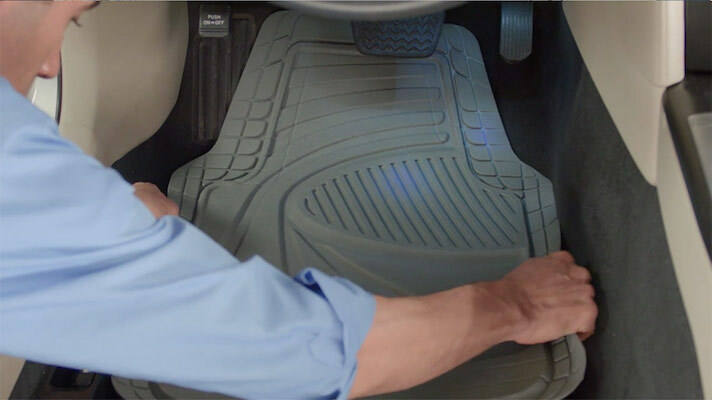 Once you have purchased your floor mat, check out these tips on how to install a floor mat properly to avoid any potential dangers while driving. Proper floor mat positioning is important for safe driving. 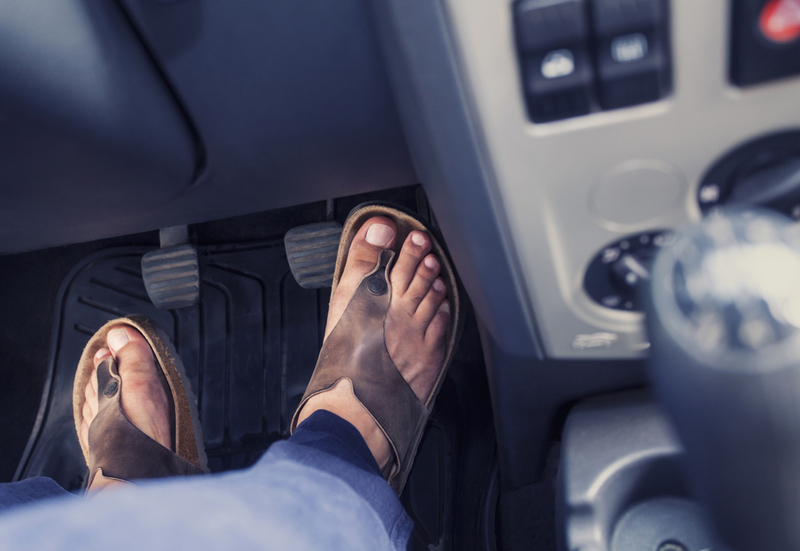 It is recommended to always check that floor mats are properly installed before driving your vehicle. If you have any questions about installing or using a universal floor mat in your vehicle, ask a mechanic for help on how to do so. Q: What should I know about the positive retention floor mats? Q: How do I check the washer fluid?